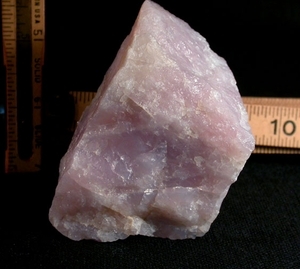 Lithium is the happy rare inclusion, which added to other impurities such as titanium, turn pink rose quartz to lavender. From a defunct California mine, this portion is colored pale orchid to lavender. It's a handy 1-3/4"x 2"x 3-1/4" and has one side cut flat despite standing naturally. Plenty of area is available for fashioning lovely, translucent gemstones.